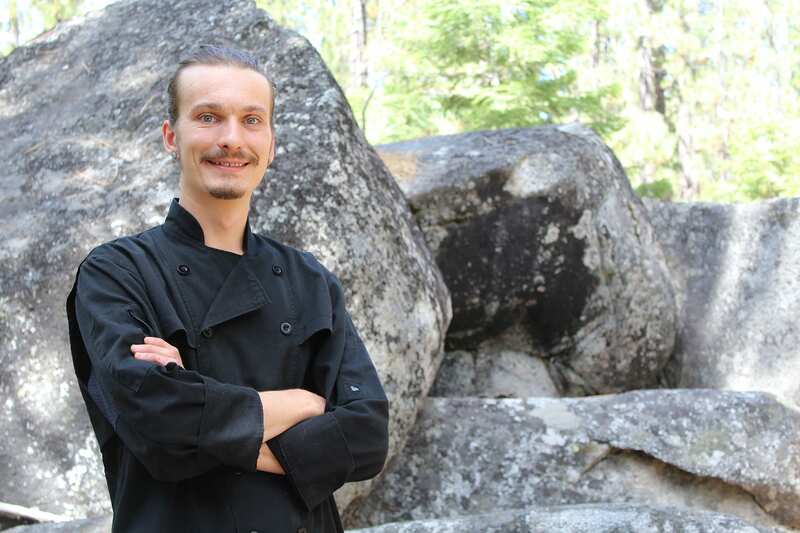 South Lake Tahoe’s Blue Angel Cafe & Catering has been dishing its global cuisine on Ski Run near Heavenly for some 15 years. Executive chef Micah Franz, who cooked at Kirkwood last winter, has worked his way around many a mountain town, including Snowmass Country Club, Vail’s Beaver Creek Resort and the Little Nell hotel in Aspen, as well as Snowshoe Mountain in West Virginia and North Carolina’s Snowbird Mountain Lodge and the Nantahala Outdoor Center. I grew up in an intentional community in western North Carolina, where around 14 families established a space centered on family, public service, sustainable living and camaraderie. It is located at the junction of the southern Appalachian Mountains and the Great Smokies, one of two deciduous rainforests in the United States, and an amazing area to grow just about anything. My love for food started with the most basic building block: ingredients. My family raised chickens for eggs and grew most of their own food during the summer. I remember going to the garden with my parents and bringing back bowls of organic vegetables: fresh snap peas, cherry tomatoes, collard greens, onions, radishes. My parents encouraged me to get hands-on with ingredients as early as I can remember, and by the time I could reach the stove I always wanted to help. I loved seeing how different techniques transformed simple pieces of nature into experiences—a hard sear building flavor, a raw vegetable adding crunch and the smell of spices toasting in the pan. I went to two years of college, studying sociology and psychology. I loved learning, but wasn’t very excited about the idea of practicing what I was learning. One night I stumbled across Anthony Bourdain’s Kitchen Confidential. The book lit a fire in my soul and I knew that I had found my calling. I dropped out of college and started working in kitchens. Unsure I wanted to go deeper into debt to learn to cook, I quickly discovered seasonal work, a world where it’s normal to have two or three different jobs in a year. Every chef, kitchen manager or line cook I worked with taught me something. I kept my head down, worked hard and never complained. Before I knew it I was in Aspen cooking for one of the most exclusive private country clubs in the nation; I was getting paid to learn how to cook classic Southern French cuisine. I met Thomas Keller, Daniel Boulud, David Chang and many more of my idols. I ended up traveling through Central America for two years and helped open a couple of restaurants; I have worked in about 24 restaurants over the course of 14 years. This broad variety of cuisines, mentors and experiences has helped shape my culinary style. What brought you to Tahoe? After backpacking and motorcycle touring through Central America for two years, I found myself running out of money and returned to the U.S. to revisit all the things I love: mountain biking, rock climbing, cooking, camping and just adventuring in general. After floating around the country for a couple of months, living out of national forests and working temporary cooking gigs at festivals, I finally made it to California. A bit of serendipity had me house-sitting a half million dollar estate in Amador County last year, very lonely, and dying to get back in the kitchen. I sent out a half dozen job applications and got an offer to run the Off The Wall Bar & Grill at Kirkwood. I had a week and a half to recreate the entire menu, build systems and get ready to train staff. After an amazing winter I knew I couldn’t leave the lake, and by the time spring had sprung, I felt at home for the first time in many years. How did your gig with Blue Angel evolve? My seasonal work at Kirkwood ended, and I was on the prowl for my next job. I really wanted to be challenged, engaged and allowed creative liberty. When I first found Blue Angel on Craigslist, I knew I was going to get the job before I even applied—it was just too perfect of a match. As soon as I met the owners, Jeff and Rosie, they made me feel completely at home. A sense of family is really important to me in a restaurant, and it was the first time in a while I had found this. I look for inspiration everywhere. I wholeheartedly believe that the future of food is sourcing locally and sustainably, cooking fresh and healthy dishes, being creative and innovative with modern plating techniques, and pushing boundaries. I try to work with what’s in season as much as possible—I think it’s socially irresponsible to serve Argentinian asparagus mid-winter, 2,000 miles away from its source. The beauty of the seasons gives us unique bounties, and as long as we are willing to adapt, improvise and evolve, we have the power to make them shine. I ask my coworkers, I ask my dishwashers, I ask my servers and I ask my friends: What do you like to eat? What do you like to cook? I also watch cooking shows, and go out to eat at nice restaurants. It’s always refreshing to me when I see someone else doing really creative things. I think that’s the beauty of the culinary field—we are all evolving new techniques and discovering new flavor combinations. And it’s not a competition, it’s co-creation. That’s easy—garlic! I love it so much I have it tattooed on my arm. I think it’s a very symbolic, unifying ingredient that brings together cuisines from all over the world, a common denominator among otherwise strikingly contrasting experiences. Aside from its deliciousness, it also has many health benefits. What’s not to love? My favorite tool of all, a short win over a slotted offset fish spatula, is my chef’s knife. I became fascinated with bladesmithing and researched all of the different types of steels and styles of knives. The consensus is that Bob Kramer is quite possibly the best knife maker in the world. I had to get my hands on a piece of his steel, but since the knives he makes sell for upwards of $30,000 at auction, I settled on a knife he designed that is handmade by Shun. It changed my life. At a 68 on the Rockwell scale of hardness, you can get it as sharp as a razor. I can literally shave with it when it’s freshly sharpened and stropped. That edge will last me weeks, and when I go to re-sharpen it, barely any metal is taken away. It’s truly a knife that will outlive me. What’s in your home fridge right now? Several bottles of homemade kombucha, six types of salsa, sprouted grain bread, containers of kimchi and sauerkraut that I wild fermented, about four pounds of bacon, a plethora of organic fruits and vegetables, and one of the funkiest blue cheeses I have ever stumbled upon. Oh, and eggs. Lots of eggs. I currently live with one of my best friends, who is also my partner. She and I have known each other half a lifetime, both coming from the same small mountain town. It wasn’t until early 2018 that we reconnected and found a spark that had never existed before, so we decided to move to Tahoe together. She brought her wonderful Manx cat, Luna, who has helped make us a family. Top Tahoe ski spot or trail? Kirkwood! I love big mountain riding. Dropping the cornice or weaving through the trees on a steep mountainside is one of the closest things to heaven I’ve found. In the summer you can find me biking Cold Creek canyon as much as possible. Locally owned and operated, the Blue Angel Cafe has partnered with the Tahoe Fund, raising over $8,000 yearly toward trail construction and restoration around The Lake. If you want to save time, buy pre-made ancho chili powder. Note that it will be far less flavorful and more expensive than homemade chili powder. To make the chili powder, place dried chilies on a baking sheet and bake at 350 degrees for 10 to 15 minutes. You will see the chilies blow up like balloons when they are ready. Be careful not to over-roast, or the flavor will diminish. You may want to use gloves at this point if you are severely sensitive to spicy foods. Take the chilies and break off the stem, then remove all seeds. Crumble the remaining fillets of chili. Using a spice grinder, food processor or blender, process the chilies into powder. Take the chili powder you made (or bought) and mix it with salt and sugar; 2:1:1 is the perfect ratio (two parts chili powder, one part salt, one part sugar). This will be your seasoning for the tuna. Set aside. This is a fusion spin on gremolata, the classic condiment traditionally served with the Italian dish osso bucco. Finely chop cilantro (stems removed) and scallions (greens only). Combine ¼ cup of the chopped cilantro with ¼ cup finely chopped scallion in a small bowl. Add olive oil, just enough to cover the herbs. Add the juice and zest of one lime. Finally, add one teaspoon of salt to the bowl and mix thoroughly. Cut tuna into manageable strips about 1 inch by 2 inches. It doesn’t matter how long they are as long as they can fit in a pan. Pour chili-salt-sugar mix onto a plate. Roll the tuna in this mixture to thoroughly coat the fish. Using a cast-iron or thick-bottom stainless steel pan, preheat to medium-high heat (7 to 10 on an electric stove). This process will create a bit of smoke if executed properly. Open windows, turn on fans, and provide proper ventilation. Once the pan is preheated, add a bit of high-heat oil (canola, avocado, coconut, grape seed, etc.) You need an oil that will hold up at around 450 F degrees. Place the tuna in the pan and sear for 10 to 15 seconds each on all four sides, rotating to sear evenly. Remove from the pan and let rest on a paper bag or paper towels. Using a sharp knife, cut thin slices of tuna. Shingle the slices, and then spoon your gremolata on top. Enjoy! 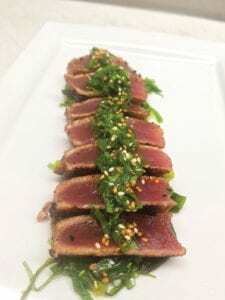 For an added Asian flare, and to make the dish more of a complete appetizer than a plate of sashimi, try serving it over a bed of wakame salad. The crunchy texture of the seaweed and sesame background make a great complement to the flavors in the dish. Take it a little further by adding toasted sesame seeds on top. If you want a little more crunch and color, you can add finely chopped or julienned radishes.